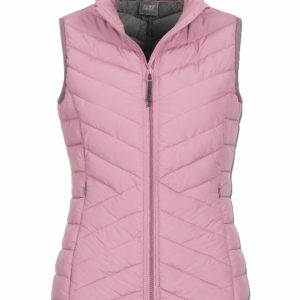 Lightweight, tailored vest with 2 hidden zip pockets, in gorgeous soft Rose colour. A slimmer silhouette without sacrificing warmth. Streamlined design with added elastic panels at waist for a better fit. Horsebit zipper pullers and leather badge on chest add a touch of sophistication with equestrian inspired details that will set this timeless elegant down vest apart from the rest. The beautifully designed lining with velvet trim details and embroidered logo lets you know you are wearing a high quality Gersemi product.